Global Voices Advocacy's Netizen Report offers an international snapshot of challenges, victories, and emerging trends in Internet rights around the world. 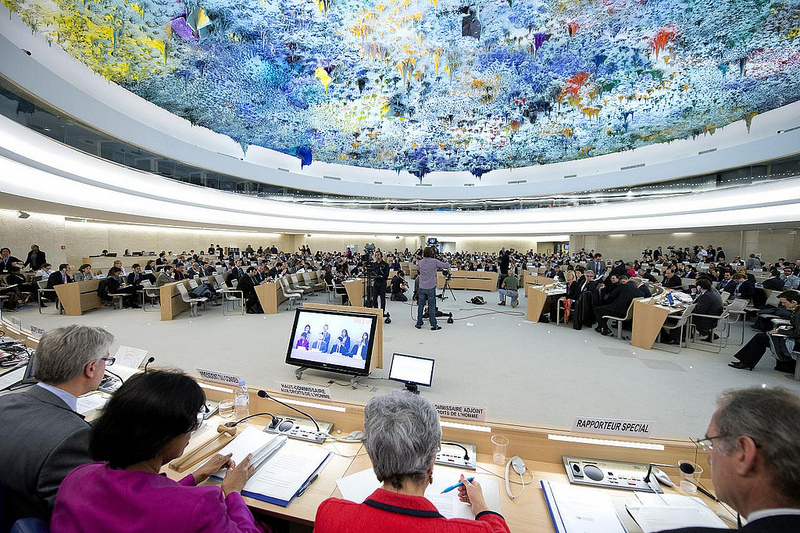 We begin this week's report in Geneva, where Internet rights advocates took an emphatic stand for online privacy before the UN Human Rights Council last week. At the UN General Assembly, Brazilian President Dilma Rouseff issued a blistering attack on NSA surveillance practices, condemning the US government for “violating fundamental human rights” and interfering with national sovereignty. Rouseff also strongly endorsed Internet neutrality, a key protection for free expression online. Brazil’s congress will soon vote on the Marco Civil da Internet, an “Internet bill of rights” that would, among other things, create strong protections for net neutrality. Sixteen-year-old student Yang Hui was arrested after he questioned the cause of death of a TV network employee in the Gansu province. Authorities said that the employee had committed suicide, but when the boy saw the man's family arguing with network officials, he took to social media to question their claims. In an official statement, authorities said that Yang's posts caused “speculation, protest and public disorder,” an offense that is often punished with jail time in China. Meanwhile, China continues its crackdown on spreading “rumors” (any information not approved by a state agency) online. The latest Chinese Internet celebrity to be taken in by the police is Boss Hua, a wrist watch aficionado who rose to Weibo microblogging fame by identifying the brands—and prices—of ritzy watches worn by public officials. He was released after spending a night in prison and posted a short “I’m freed, thanks” message on Weibo. In an essay for the Wall Street Journal, legal scholar and China expert Stanley Lubman maps out the legal basis for China’s crackdown on Internet rumor-mongering. The Parliament of Grenada approved the Electronic Crimes Act earlier this month, a law that criminalizes sending messages that are “grossly offensive,” “of a menacing character,” are sent “for the purpose of causing annoyance,” and more. The law places tight restrictions on file sharing and the use of encryption and covers a range of other areas, including data breaches, spam, and identity theft. It also outlaws placing prank calls to law enforcement agents. Spanish lawmakers approved amendments to the nation’s copyright law that increase punishments for piracy and copyright violations. Among other things, the amendments introduce new punishments for individuals who link to copyrighted material published by unauthorized entities for “direct or indirect” profit. After publishing its biannual Transparency Report, professional networking site LinkedIn announced that it has petitioned the US Foreign Intelligence Surveillance Court for permission to periodically publish the number of national security-related data requests it receives from the government. LinkedIn also filed an amicus brief in the US Court of Appeals for the 9th Circuit urging affirmation of the district court’s ruling in the case of In Re National Security Letter, which held that national security letter disclosure restrictions (aka “gag orders”) violate the First Amendment. Four users of the service are filing a class action lawsuit against LinkedIn, claiming that the company’s practice of accessing user email accounts, harvesting the email addresses of their contacts, and then repeatedly sending their contacts invitations to join the service, violates state and federal laws. Netizen Activism: Sakharov Prize for Snowden? Thanks to the support of the European Parliament’s Greens and leftists, Edward Snowden is one of seven nominees for the European Parliament’s Sakharov prize for freedom of thought. Constitute, a new database created by the Comparative Constitutions Project, offers digitized versions of the world’s constitutions, making them easy to read, search, and compare. Scientists who analyzed China’s microblogging platform Weibo found that anger spreads “faster and more broadly” than joy, according to the MIT Technology Review.